A simple drum programming controller that's simple and enjoyable to use. Plenty of control options. Makes drum programming fun. Easy to set up. Not a stunner to look at. Now let's be honest here: MIDI controller keyboards weren't designed for drum programming. OK, so you can do a decent enough job on them, but what if you had a controller that was specifically designed for the purpose? Well, here's one such device from the M-Audio stable. 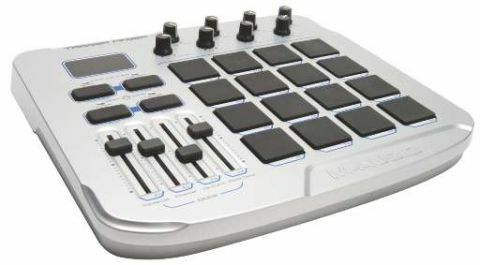 Design-wise, the Trigger Finger draws heavy inspiration from Akai's MPC range, and it's actually Akai that produces one of this unit's closest competitors in the shape of the MPD24. With 16 velocity- and pressure-sensitive pads plus a generous sprinkling of knobs and sliders, there's plenty of control for your cash. This is all wrapped up in a functional, well-built little unit that may not win any awards for its rather drab looks, but does the business when it comes to fuelling inspiration. Fire up your favourite drum package, assign the pads to sounds using M-Audio's Enigma editing software, and you'll be transported to a world where bashing out your rhythms is an immensely enjoyable experience. The pads feel spot on, there's enough additional control for effects, and you won't believe how inspiring and fun drum programming will become. Is that worth £169 to you? We should hope so.